We continue with part 8 of Gregory DiPippo's consideration of the texts, ceremonies and history of the Holy Week ceremonies from before and after Pope Pius XII's reforms in 1955. This particular part will focus upon the question of the times in which the various Holy Week liturgies were celebrated and how they were reformed. Prior to the Holy Week reform of 1955, the services of the Triduum were all “anticipated”, so that the Tenebrae services, Matins and Lauds of the three days, all took place on the preceding evening, and the three Masses (including the Easter vigil) took place in the morning. I have a Holy Week book formerly owned by a canon of St. Peter’s; when I bought it, it contained a clipping from a newspaper of the year 1930, listing the Holy Week services in several Roman churches. At St. Peter’s Basilica, the Tenebrae services began at 4:45 p.m. each day, and the three Masses at 9:15 a.m. A similar schedule was observed by various Byzantine Rite churches in the city, such as the Pontifical Russian College; this schedule remains the norm in Byzantine churches to this day. The reform of 1955 prohibited this practice; Tenebrae services were now to be held in the morning, the Mass of the Lord’s Supper and the Mass of the Presanctified (renamed) were to be held in the evening, and the Easter vigil at night. The hour of Matins was originally called vigiliae, Latin for “watches”; this name occurs frequently in the Rule of Saint Benedict, and is retained by the Cistercian Breviary. The term derives from ancient Roman military usage, which divided the night evenly into four watches, regardless of the length of the night itself. The early Christian choice of this military term for the night-time service of psalms and readings gives the idea of a ‘militia Christiana’, keeping watch in the monasteries and cathedrals. The original nocturnal character of Matins is still indicated by the universal custom of the West of dividing the hour into “nocturns”; this term is even used in the Ambrosian Rite, the Matins of which is quite different from that of the Roman and Monastic Rites. The Hour of Lauds was originally known as “Laudes Matutinae”, “morning praises” ; later the name was shortened to “Laudes”, and “Matutinae” transferred to the vigils. This seems to result from the generally accepted custom of always singing the two hours together as a unit, a custom which is simply assumed as the norm by the Breviary of St. Pius V, and earlier Breviaries as well. Only with the revision of St. Pius X was a rubric provided for the separation (in private recitation only) of Matins from Lauds. Coming at the end of Matins, Lauds becomes the fourth of the ancient Roman military watches, that which sees the arrival of the dawn. It should be understood, therefore, that the ancient custom of “anticipating” Tenebrae to the preceding evening is not the anticipation of a morning office by several hours, but rather, the anticipation of a night office by a few hours, with Lauds being joined to Matins on these days as on others. Prior to the invention of precise timekeeping devices, the “eighth hour” which St. Benedict gives as the ideal time for Matins, cannot always have been calculated very precisely. It is probable that Matins sometimes started at a rather later part of the night than what we call midnight, and sometimes rather earlier. It must also be pointed out that the special ritual of Tenebrae, which has always made it such a popular and loved part of Holy Week, is clearly much more appropriate to night than to morning, and clearly arose from the custom of celebrating the office, or at least ending it, after sunset. It is interesting to note that nowadays, a great many churches which use only the post-Conciliar reformed liturgy still do some form of Tenebrae service on one or more evenings of the Sacred Triduum, or even on Spy Wednesday, and do not publically celebrate any of the post-Conciliar Liturgy of the Hours at all on those same days. Lastly, it should also be noted that during the Sacred Triduum, none of the Hours makes any more than casual references to the actual hour of the day. All of the elements which traditionally define the liturgical hour, such as the invariable collects of Prime and Compline, and hymns such as “Jam lucis orto sidere”, are omitted. Thus, the the anticipation of the minor hours to the morning, and the Tenebrae services to the evening, does not really jar with the “proper” liturgical time of day. In Lent, there was in antiquity a particularly close connection between the celebration of the Divine Office and the Mass. The Lenten fast was originally kept each day until the hour of None, roughly two or three o’clock in modern terms. None was followed by Mass, and then Vespers, after which the people would have their single meal of the day all together. This ancient practice is reflected in the rubric of the Breviary of St. Pius V that Vespers are to be said before the principal meal of the day. (By the sixteenth century, the discipline of the ancient Lenten fast had been considerably relaxed, and the custom had become almost universal of anticipating all of the hours, including Vespers, to the morning, and breaking the fast around noon.) “Ita, missa est” is traditionally not said at the end of the Mass on fasting days; since the community remained together, and broke its fast together after the Mass, it was therefore not dismissed. This is also the reason why the Mass of the very last day of Lent, Holy Saturday, traditionally ends with Vespers, which return thereafter to being sung at their normal time. In some rites, such as that of the Premonstratensian Order, this custom was extended to the other days of the Triduum, and Vespers were said as the Postcommunion of the Masses of the Lord’s Supper, and of the Presanctified. As noted previously in the article on the Mass of the Lord’s Supper, the Roman Rite treats Holy Thursday as a solemn feast of the Lord. The "Gloria in excelsis" and the Nicene Creed are sung, the vestments are white, and “Ita, missa est” is said at the end, rather than the older formula “Benedicamus Domino”, all characteristics of feast days. In ancient times, Holy Thursday itself was sometimes referred to as “natalis calicis – the birthday of the Chalice”, as the feasts of the martyrs are called “natalis dies” the day of the martyr’s birth into Heaven. I would suggest that the festal character of Holy Thursday is the real reason why the Mass of the Lord’s Supper came to be anticipated to the morning, rather than a universal neglect of the “proper” liturgical hour. The hour observed by St. Peter’s in 1930, and in the Byzantine Rite to this day, is the normal time for Terce, after which Hour, on major feast days and Sundays, the solemn Mass should properly be said. Indeed, the first Ordo Romanus indicates explicitly that the Mass is to be said “hora tertia”. With the great increase of devotion to the Blessed Sacrament in the High Middle Ages, the procession of the Sacrament to the Altar of Repose became one of the major features of the rites of Holy Thursday; the anticipation of the Mass to the morning left more time for the faithful to pray at the Altar of Repose, until the Tenebrae service of Good Friday began. According to the first Ordo Romanus, the liturgy of the Presanctified was also celebrated “hora tertia” by the Pope in the mid-7th century; the first part of it, the Mass of the Catechumens, was then repeated by the parish clergy in their churches towards evening. I suggest that the parallels between this rite and that of the ordinary celebration of Mass, which serve to show the intrinsic union between the Last Supper and the Crucifixion, are the reason for its very ancient “anticipation”, rather than neglect or lack of interest in the “proper” time. The Mass of the Presanctified is the compliment of the Mass of the Lord’s Supper, and part of the same solemnity. Clearly, the ancient Church did not believe that the faithful heard the Passion of Christ less devoutly, or commemorated the Sacrifice of Calvary less vividly, by doing so at an earlier hour than the true hour of Christ’s death. The Passion of Christ is read four times during Holy Week, and is thus “anticipated” by five days on Palm Sunday, by three on Holy Tuesday, and by two on Spy Wednesday. The proper hour for the celebration of the Easter vigil is also traditionally after None, as in all the ferial days of Lent. According to the first Ordo Romanus, the catechumens were prepared for baptism on the morning of Holy Saturday, around the time for Terce, and then dismissed, to return for the vigil in the evening, which began after None. Likewise, Gratian’s Decree, one of the most important works of mediaeval canon law, states that “…on Holy Saturday, the solemn Mass is to be celebrated towards the beginning of night.” (De consecratione, Distinction 1, Canon 50) The blessing of the Paschal fire is clearly a ritual for evening, and the text of the Exsultet says explicitly “This is the night…” four times in a row. However, it must not be thought that the Church, by anticipating this service to the morning, celebrated the Resurrection of Christ on Saturday morning. As noted in the article on the Mass of Holy Saturday, the Easter vigil, is not a first Mass of the Resurrection; it is a vigil, a keeping watch. The incomplete character of the Mass, which omits the Introit, Creed, no Offertory antiphon, Agnus Dei and Kiss of Peace, clearly indicates that the Church, although confident of the Lord’s Resurrection, still awaits the actual rising and public manifestation of the Risen Lord. A similar custom obtains in the Byzantine Rite, in which a Divine Liturgy is celebrated on the morning of Holy Saturday. This Liturgy refers repeatedly to the fact of the Resurrection, but the famous Paschal hymn “Christ is risen from the dead, by death trampling upon death…”, the Byzantine Easter hymn par excellence, is not sung until the Matins of Easter Sunday. 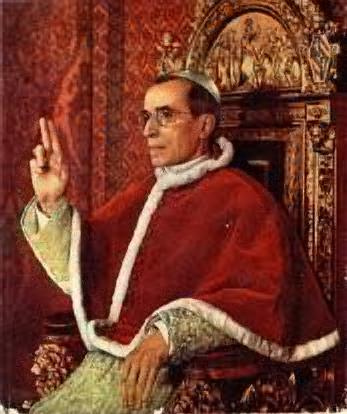 The reform of Pope Pius XII did not in fact restore the Easter vigil to its proper historical time after None, since it mandated that the vigil is to start at such an hour that the actual Mass will begin around midnight. The Divine Office of Holy Saturday was rearranged in such a way that Saturday itself has both Vespers and Compline, where formerly Vespers, that is, the first Vespers of Easter, was sung as the Postcommunion of the vigil, and Compline shortly after. This change is based on a theory commonly held by liturgists at the time, though there is no substantial base to this, that the twelve prophecies of the vigil form a sort of Matins. (See for example Batiffol’s History of the Roman Breviary, p. 128 of the 1898 English edition.) For this reason, the Easter vigil was then made to conclude with a newly constructed Lauds. Where the former practice of anticipating the vigil to the morning jarred notably with the blessing of the fire, and with the singing of the Exsultet, the newer practice has Lauds being sung at one or two o’clock in the morning. What was suggested to be a confusing lack of harmony with the hour of the day is simply moved from the beginning of the service to the end. The changes to the Holy Week services are often explained as resulting from the need to restore these services to their “proper” times. However, it must be understood that the changes to the actual rites and texts of Holy Week have nothing to do with either the traditional schedule, or the new one. Only two of the services of Holy Week are appreciably changed in length by the actual reform of the Missal and Breviary, the Mass of Palm Sunday, and that of the Easter Vigil. The hour of the former is not affected at all by the reform. There is no particular reason why the Easter Vigil as it was prior to 1955 could not be celebrated at the hour newly appointed by Pope Pius XII. This was in point of fact done for a period of about 5 years; the nighttime celebration of the Easter vigil was approved on an experimental basis in 1951, and this was done in some places, but with the older rite, 12 Prophecies and all. None of the changes made to Holy Thursday or Good Friday changes the length of the service in a notable way.